Sunday April 4th 1897 As soon as we got the work done we went up to Elmer Andrews to spend the day. Frank & George Stevens were there. A pleasant visit we had. A shower kept us there till we were late home. After the work was done. I read a little. Monday April 5th 1897 Will went up to Steves for our meat this morning. I put in the morning looking for turkey nests. I was over to Auntys a moment. Henry & Karl were down and Karl ate dinner with us. Will helped me wash after dinner. It was a showery afternoon. I read all the evening. 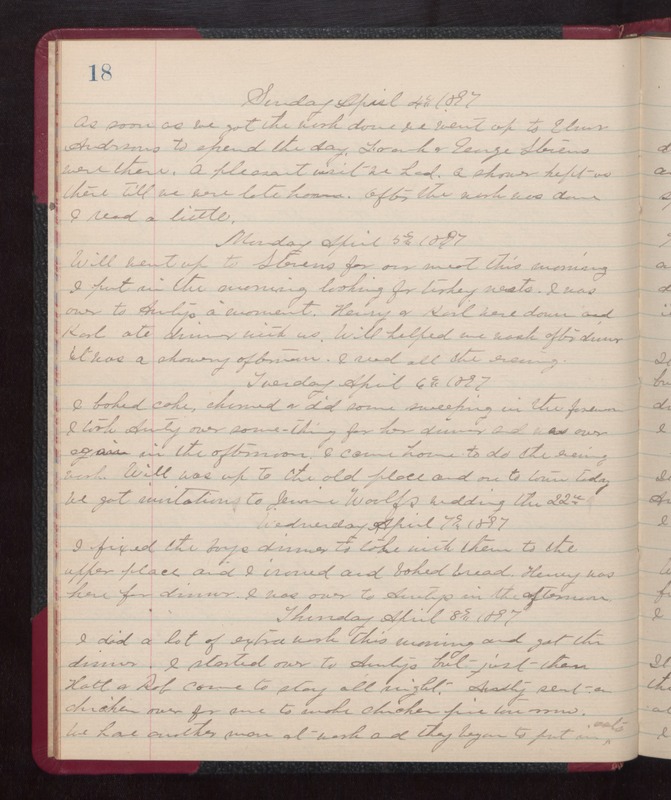 Tuesday April 6th 1897 I baked cake, churned & did some sweeping in the forenoon. I took Aunty over something for her dinner and was over again in the afternoon. I came home to do the evening work. Will was up to the old place and on to town today. We got invitations to Jennie Woolfs wedding the 22nd Wednesday April 7th 1897 I fixed the boys dinner to take with them to the upper place and I ironed and baked bread. Henry was here for dinner. I was over to Auntys in the afternoon Thursday April 8th 1897 I did a lot of extra wash this morning and got the dinner. I started over to Auntys but jist then Hattt & Rob came to stay all night. Aunty sent a chicken over for me to make chicken pie tomorrow. We have another man at work and they began to put in oats.